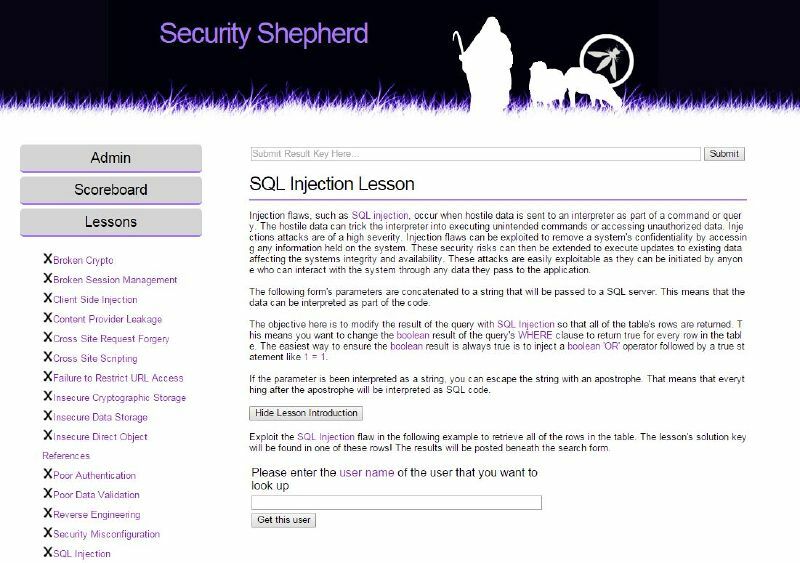 The OWASP Security Shepherd Project is a web and mobile application security training platform. Security Shepherd has been designed to foster and improve security awareness among a varied skill-set demographic. The aim of this project is to take AppSec novices or experienced engineers and sharpen their penetration testing skill set to security expert status. Where can I download Security Shepherd? How do I setup Security Shepherd? We’ve got fully automated and step by step walkthroughs on our wiki page to help you get Security Shepherd up and running. What can Security Shepherd be used for? Shepherd includes over sixty levels across the entire spectrum of Web and Mobile application security under a single project. Shepherd is a perfect for users completely new to security with levels increases in difficulty at a pleasant pace. Each security concept when first presented in Shepherd, is done so in layman terms so that anyone can beginner can absorb them. The security risks in Shepherd are real vulnerabilities that have had their exploit impact dampened to protect the application, users and environment. There are no simulated security risks which require an expected, specific attack vector in order to pass a level. Attack vectors when used on Shepherd are how they would behave in the real world. Shepherd can be used locally by a single user or easily as a server for a high amount of users. Shepherd gives its players user specific solution keys to prevent students from sharing keys, rather than going through the steps required to complete a level. Security Shepherd has a configurable scoreboard to encourage a competitive learning environment. Users that complete levels first, second and third get medals on their scoreboard entry and bonus points to keep things entertaining on the scoreboard. Security Shepherd admins can create users, create admins, suspend, unsuspend, add bonus points or take penalty points away user accounts with the admin user management controls. Admins can also segment their students into specific class groups. Admins can view the progress a class has made to identify struggling participants. An admin can even close public registration and manually create users if they wish for a private experience. Shepherd has been used to run online CTFs such as the OWASP Global CTF and OWASP LATAM Tour CTF 2015, both surpassing 200 active users and running with no down time, bar planned maintenance periods. An administrator can enable a feedback process, which must be completed by users before a level is marked as complete. This is used both to facilitate project improvements based on feedback submitted and for system administrators to collect “Reports of Understanding” from their students. The logs reported by Security Shepherd are highly detailed and descriptive, but not screen blinding. If a user is misbehaving, you will know.